This week is National Volunteer Week! The week is meant to bring awareness to people to give time to their community. Since it began, this week has become a nationwide effort to urge people to get out and volunteer in their communities. If you don’t know by now, we love all of our volunteers! Doobert is supported by over 14,000 volunteers who work passionately to give animals a better life. As a volunteer, you bring hope for these little paws and see the sparkle in their eyes and smiles on their faces. Sign up to be a driver, foster, pilot or a photographer! Local animal shelters almost always need volunteers. Brush up your office skills by answering emails, fielding phone calls, providing general administrative assistance and walking dogs. Volunteering at a national park means more than just cleaning up litter. If you’re a history buff or a naturalist, you can explore opportunities to work at fascinating historical sites maintained by the National Park Service. Food pantries and soup kitchens can always use a helping hand organizing a local food drive, raising money, or simply handing out hot meals to those in need. Check out FoodPantries.org to search for one near you. Habitat for Humanity offers various local volunteer opportunities. If you have, or want, experience in home repair and building maintenance this is a good fit for you. Your experience can contribute directly to team-building and leadership ability and helping build someone a new home. 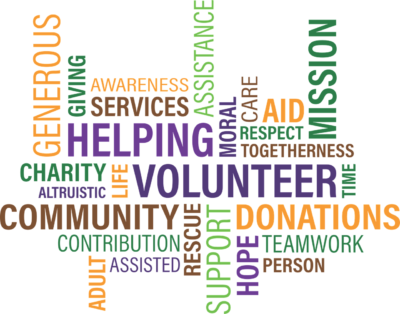 We want to thank everyone who volunteers and has a part in their community. A special thanks to our Doobert volunteers who share the same passion as us and give animals a second chance. Let us know how you get involved in your community!